Making Loop 335 "shovel ready"
AMARILLO, TX (KFDA) - The Amarillo Metropolitan Planning Organization (MPO) has made Loop 335 a priority, and members discussed the status of current projects as well as development in the future at a meeting this afternoon. Amarillo mayor Ginger Nelson said we currently have three times the number of projects that we could actually use our federal highway funds to pay for, and they are pushing them to become "shovel ready" in the event extra federal highway dollars become available. Nelson says getting Loop 335 built is at the top of their list. "How do you eat an elephant? You do it one bite at a time and that's a large project at like $1.4 billion worth of costs to build it," said Nelson. "So it's in multiple stages and many of our top priority projects are related to getting the loop completed." The MPO discussed those stages, and prioritized the projects they want to use federal highway dollars on. 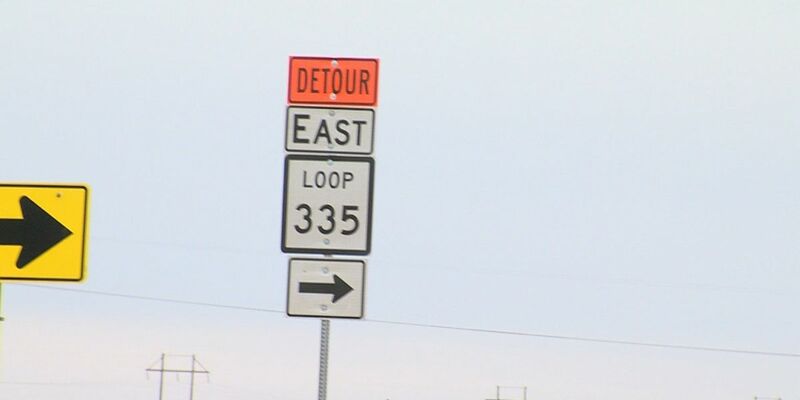 According to The Texas Department of Transportation, the goal is to expand Loop 335 into a four-lane freeway with frontage roads. Currently the area near Randall High School is being worked on. The frontage roads are now open in the area and they're working on building main lanes. Also, the replacement of the I-27 bridges at Loop 335 just started a month ago. Coming up next is the work in the westward areas. We're told the section near Hollywood is expected to be complete by 2021. The loop will push out a mile to the west in hopes of alleviating congestion by the mall on Soncy. The MPO also approved a motion to extend the Metropolitan Area Boundary into Canyon. The boundary hasn't been updated since the 1970's, and the expansion will allow them to use federal dollars in those areas to continue construction. "Right now where the boundary hits is about at Rockwell Road on I-27," said Nelson. "So that means if we were to do an expansion project on I-27 to expand it to six lanes, we would have to stop that expansion at Rockwell Road because we can't use federal highway dollars outside of our metropolitan area boundaries. So it's the time to expand it." Canyon mayor Gary Hinders agreed that the expansion is a win-win situation. "I think it is well known that we are all part of a larger area," said Hinders. "A lot of commute between Canyon and Amarillo, but also Amarillo to Canyon and as that traffic count has grown to close to 40,000 cars a day allows that to be addressed in the future as well." With more than $1.1 billion of the project currently without funding, Nelson hopes the community will be thankful we don't have to come up with the money locally. "I think citizens just have to know that this is the pace of large scale infrastructure project," said Nelson. "It does involve orange cones, and we just have to decide to have an attitude of gratitude that we have federal highway dollars that can improve our infrastructure." The boundary decision has to now go back through TxDOT and then to the transportation commission at the federal level. Nelson estimates the approval time to be two to three months. Once that happens, they plan to include Canyon on their board to help continue their transportation projects.